A strong showing from the TA2 Muscle Car Series at the Bathurst 12 Hour concluded on Saturday afternoon with the third and final race with the Skye Sands Combined Sedans support category. 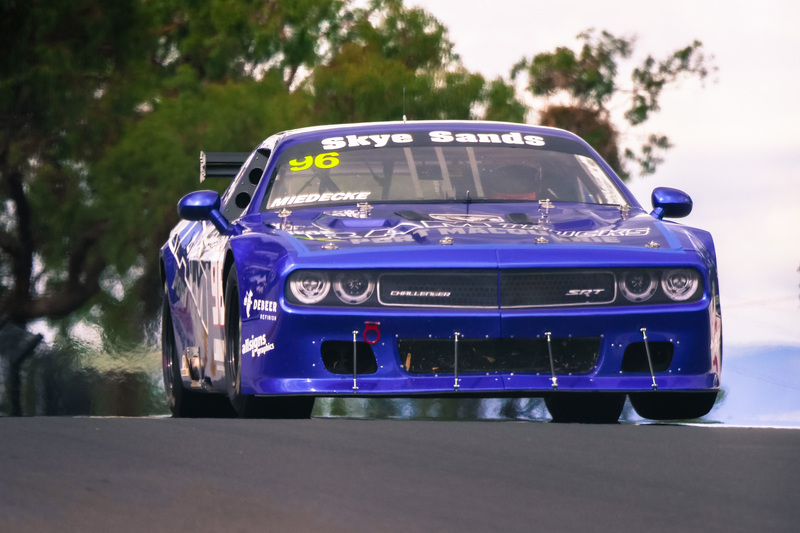 Dodge Challenger George Miedecke emerged as the clear pace setter in the 13-car TA2 contingent, with the former Super 2, V8 Ute and Australian GT racer firmly announcing himself as a serious title contender for the 2019 series. After a strong run in the opening two races, Ford Mustang racer Ian McAlister’s weekend ended early after finding the wall coming over skyline on lap five while battling with Matthew Ingram’s Mazda RX8. After ending race two in the gravel trap, Rusty French elected to sit out the final race of the weekend, leaving 10 of the 13 TA2 cars to start and finish every race of the weekend after Greg Willis’ fuel pump issue before race two. Miedecke finished third outright in the final race of the weekend, leading home two-time American TA2 champion Gar Robinson in fifth, while Hugh McAlister finished third for the weekend after a seventh place finish in the final outing. Russell Wright and Michael Kulig also scored top ten finishes in eighth and tenth respectively. Peter Robinson and Anthony Tenkate enjoyed a race long battle, as the pair followed Kulig home just outside of the top ten. Greg Willis drove a strong final race to climbing 20 positions from the rear of the grid to finish 25th, while Cameron Sendall, Don Dimitriadis and Mark Crutcher all took the chequered flag after three consistent showings. Reflecting on the weekend, Miedecke was impressed by the performance of the TA2 cars throughout the weekend which allowed him to battle at the front of the Combined Sedans field. After joining the series at the final round of the 2018 season, Miedecke praised the TA2 package and looks forward to his upcoming championship campaign. “I’m not surprised by how this series is growing. These cars are just awesome and they’ve been Australian motorsport’s best kept secret for the last couple of years. “Now people are starting to see them on the track, they see them lifting wheels and spitting flames and doing all this cool stuff, also the fact that these cars are very cost effective to run. The TA2 Muscle Car Series will announce their 2019 plans shortly.